MATE Desktop is based on GNOME 2 and provides an intuitive and attractive desktop to Linux users who seek a simple, easy to use traditional interface. Update 10-11-2012: All packages approved and pushed to Fedora 18 stable. Comps commit made, is visible in Anaconda. Works out of the box after Anaconda install. Currently using lightdm. Still working out final kinks. Setting up a QA test day. MATE is a traditional Gnome 2 like desktop user interface. Many users have expressed interest in this feature since Fedora 15 in which Fedora was switched from Gnome 2 to Gnome 3. For the advanced user that doesn't want a cutting edge desktop and just wants to keep it simple this is perfect for them. 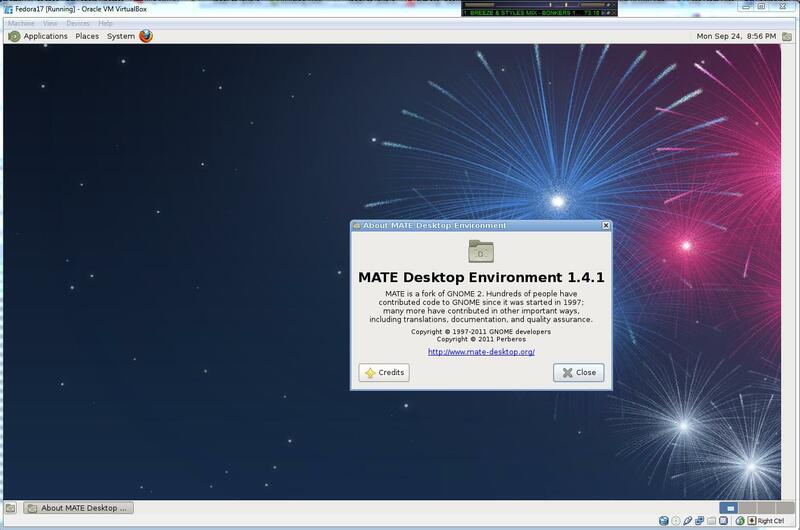 The popularity of MATE Desktop is very high. It is one of the 2 choices of DE's for Linux Mint which is one of the most popular Linux distros out right now. Attract new users to Fedora. Give users another choice and freedom to choose what type of DE/WM they would like to use. This is one of the core foundations of the Fedora project. Upon approval of all packages (and changes to comps git) a user would type "yum install @mate-desktop" and it would be added to their list of sessions to log in to on start up. A "nice to have" feature would be to be included in the Anaconda install from the DVD (from my understanding commit to comps would cover this). It will improve the user's desktop experience by giving them another choice of Desktops that they can use with Fedora. Please see MATE-DE-Tracker for more information. The main dependencies required by this package are python, GTK2, automake, libtool, gettext and pkgconfig. mate-common will provide automake autoconf gettext intltool libtool so that it will not be in every package's buildrequires. If this feature is not ready by the deadline it will be included in the next Fedora release. This is the initial release of MATE Desktop for Fedora 17/18. It brings back a classic, intuitive, and easy to use desktop that users have been long requesting. Release notes will be further updated as the completion of the project draws near. The import of the base packages is 100% complete. Extras are slowly being added. For support please join #Fedora-MATE or #MATE on freenode irc or file a bug in redhat bugzilla. This page was last edited on 27 November 2012, at 10:01.